I agree that this is a limitation of the book. My qualifications for writing the book are that I’ve led group meditations for six years and that, as a journalist, I’ve interviewed neuroscientists, psychologists and mindfulness teachers about meditation. My main focus in the book with regard to mental illness is to do no harm. See the bottom of this post for an excerpt from the book in which I talk about harmful side effects that have been observed among meditation practitioners. Negative side effects from meditation are uncommon and when they do occur are usually the outcome of long silent retreats rather than the type of short meditations I share in the book. Nonetheless, I recommend that people suffering from mental illness approach meditation cautiously and do so with the support of a qualified mental health professional. That said, I’ll add some comments here that could be useful to a person seeking to work through mental health issues with a therapist. An analysis of published literature on anxiety and depression finds that mindfulness-based therapies can be helpful. However, I don’t see any randomized trials comparing mindfulness-based therapies to other therapies to determine whether mindfulness is as good or better than other forms of therapy. Different therapies may work better for different people. There is evidence that Mindfulness-based Cognitive Therapy can help prevent relapse into depression. The key word here is “relapse.” Teasdale et. al. write ”It is important to note that MBCT was specifically developed for remitted patients and is unlikely to be effective in the treatment of acute depression, where factors such as difficulty in concentrating and the intensity of negative thinking may preclude acquisition of the attentional control skills central to the programme.” In other words, mindfulness can help prevent depressive episodes, but it’s hard to learn mindfulness during an acute episode of depression. There is a literature on mindfulness-based therapies for Obsessive-Compulsive Disorder. It makes sense to me that mindfulness can help with OCD. A few years ago, I interviewed a couple of therapists about OCD for an article that was never published. I learned that OCD is a disorder of the habits system. Mindfulness can help us recognize the things that trigger us to perform habits. When we understand what triggers us, we can outsmart the triggers by, for instance, seeking environments that don’t contains those triggers. There is interest in exploring whether mindfulness can be helpful in treating Post-traumatic Stress Disorder. However, it does not appear to me that the evidence is in as to whether it’s effective. I found a pilot study showing that loving-kindness meditation might be helpful for people dealing with schizophrenia. However, it seems very preliminary. Mindfulness and meditation by themselves may not be adequate substitutes for therapy for people with mental illness. Nevertheless, it may be worthwhile to find a therapist who is supportive of meditation and mindfulness, and to do so, the place I’d start is the directory at the Institute for Meditation and Psychotherapy. Are there any risks associated with meditation? Just because meditation is “natural” and does not involve the ingestion of drugs doesn’t mean it can’t have negative effects. It’s unlikely that a twenty-minute meditation like the ones presented here will cause such problems. But meditators on long retreats that involve days of silence and isolation have occasionally developed mental illnesses that require professional treatment. So if you have any history of mental health problems or severe trauma, exercise caution and seek out a good teacher as you start to meditate. The Brown University neuroscientist Willoughby Britton, who is a meditation practitioner, warns that most advanced practitioners face challenging side effects along the way. This can include anxiety, mood changes and awareness of unusual bodily sensations. “It does seem to be the case that the longer that you practice and the more intensely that you practice that these types of experiences seemed to be the norm,” she told Vincent Horn in an interview for the Buddhist Geeks podcast. I’ve asked the exact same question, concerned that at least we “do no harm.” The answers I’ve gotten are this: in short-term ways of focusing on the breath or focusing on something internally for a few minutes, there is no negative side effect and there is no condition for which that’s a problem. Even for someone with psychosis, three, four minutes of inward focusing where you’re present with them — they can come right out of it and talk to you about it. That’s what I’ve been told by professionals in the field. For long, extended meditations, that can become problematic, and for week-long silent retreats, it can become extremely problematic because the brain is a very social organ and it requires social communication to maintain its sense of equilibrium. …For these longer ones, we want to really be careful. Herbert Benson warns against meditating for too long in The Relaxation Response. Benson writes, “From our personal observations, many people who meditate for several hours every day for weeks at a time tend to hallucinate.” Benson wrote that he’d never observed such a side effect in people who practiced meditation for ten to twenty minutes at a time once or twice a day. Treat meditation as a form of exercise. Trying to bench press too much weight can lead to injury. Sitting quietly for twenty minutes is unlikely to harm you. But if you have little experience, meditating for long periods can be risky. It’s wise to build up a meditation practice slowly, and ideally in a community with other people. If you meditate and you experience disturbing thoughts, stop. Instead of meditating on your own, seek the guidance of an experienced teacher. Mary Garden, “Can Meditation Be Bad for You?” Humanist, September–October 2007. Caleb Daniloff, “Treating Tibet’s Traumatized: SPH’s Michael Grodin blends Eastern Healing and Western Medicine to Aid Torture Victims,” Bostonia, Fall 2009. Willoughby Britton, “BG 232: The Dark Night Project,” Buddhist Geeks, September 2011, www.buddhistgeeks.com/2011/09/bg-232-the-dark-night-project. Herbert Benson, The Relaxation Response (New York: Morrow, 1975), 172. 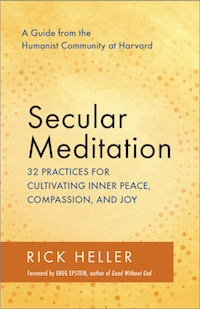 I’ve been doing more radio and podcast interviews about my book, Secular Meditation. I was interviewed by Ted Meissner for the Secular Buddhist Podcast. That was a return appearance. I was also on the podcast back in 2012. I was interviewed by Andy and Jack for the Naked Diner Podcast. As you can imagine from the title of their podcast, it’s a more irreverent interview than most. I was interviewed by Todd Alan and Debby of Life Mastery Radio. I was interviewed by Paul John Roach on Unity Online Radio. I was interviewed by Drew Taddia of the Exploring Mind and Body radio program. It’s common to meditate while listening to beautiful music, but I’ve found that meditating to ambient sounds — whatever sounds are present at this very moment — is not only a wonderful meditation, it provides a deep insight into where we can find joy in our lives. Mindfulness is the practice of paying attention to what is going on in the present moment with a nonjudgmental spirit. When we describe a sound as “noise” we’re applying a judgment. In a mindfulness of sound meditation, there is no such thing as noise — only sound. The amazing thing is that when we welcome “noise,” our perception of it changes into something stimulating and absorbing. Find a comfortable place to sit and close your eyes. Take a deep breath or two and relax. After that, there’s no need to follow your breath. 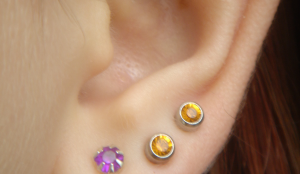 Now, start paying attention to sounds. If meditating indoors, you may hear creaks, rustling, and sounds from electrical appliances. If you’re outside, you’ll probably hear a cornucopia of sounds — wind, birds, traffic. For as long as this meditation lasts, there are no bad sounds. When you hear a sound, don’t merely note it and shift your attention away. Try to follow the sound for its entire duration. Notice the hiss, rumble, whine, screech, and whoosh. When you focus on sounds with nonjudgmental attention, what could be irritating becomes enlivening. Try to focus on the bare sound itself without attaching a narrative to it. So if you hear a siren, notice how the sound rises in volume and pitch as it approaches and falls as it grows distant. Try not to elaborate on your perception of sound with thoughts like, “I hope no one’s house is on fire.” If you notice that you are attaching a narrative to a sound, gently let that go and pay attention to any new sounds that may appear. The sound of an overheard conversation is perhaps the most difficult to let go. If you overhear people talking, focus on the speakers’ vocal qualities rather than on the content of their speech. Listen to individual words and let them go without trying to assemble them all into a meaningful sentence. In a lull during which there are no sounds, you can shift your attention to your breath — perhaps to the sound of your breathing. But if other sounds do arise, turn your attention back to them. The joy one experiences when being mindful of stereotypically unpleasant sounds demonstrates the principle that nothing is disagreeable until we judge it so. The ancient Stoic philosopher Epictetus said, “What disturbs people’s minds is not events but their judgments on events.” Similarly, Buddhist philosophy holds that suffering originates in our aversion to what we experience in the present moment. When we engage with the present moment mindfully and without aversion, the sense of suffering fades. This may seem counterintuitive, but this principle is consistent with what neuroscientists have learned about the brain’s salience network — the network of brain regions that monitor how we’re doing compared to our goals. The feeling of suffering is in essence a feedback signal warning us that a gap has opened up between our desires and reality. If your goal is to study for a test, the sound of a siren outside conflicts with your desire and is therefore unpleasant. But if you are doing an ambient sound meditation, the very same siren helps you toward your goal and you may perceive it as pleasant or even enthralling. This insight extends well beyond the realm of sound. Just as we can transform “noise” into something positive, through mindfulness, we can bring a sense of friendliness and acceptance to any difficult circumstance. There are, of course, cases of injustice that ought to be resisted rather than accepted. Present moment acceptance is not a panacea but a tool to be applied wisely. But, as we go about our day, we may encounter moments of minor irritation that are best treated as the noise of daily life. Through mindfulness, we can transform our reaction to them and experience that moment as something wonderful.